There were 4 posts published in May (this is page 1 of 1). Playing the lottery is taking a chance. Few people win, but people still play. Taking chances in the workplace is the same thing, only you don’t want your number to come up. When you take chances and your number does comes up, do you get to pick what happens to you? Cuts, sprains, fractures, disabling injuries, the big “D.” So you think you can deal with it. What about your family? Can they deal with it? Back to step one. For the employee, recognizing the danger means knowing what activities are part of the task: think MOTELS. Everyone should be familiar with the activities and conditions represented by MOTELS and the specific dangers associated with them. The supervisor needs to know that and more, so she or he can properly monitor and anticipate problems. If a JSA has been developed, the supervisor already has a great tool for managing conditions and employees activities. However, if no JSA is available then the supervisor must do a “Danger Check” to make sure all the dangers have been recognized and reviewed. While the “Danger Check” is not a replacement for the JSA, it is a helpful tool for supervisors. It should be completed for all tasks regardless of how simple or complicated the task. At a minimum, it provides the supervisor with a sensible method to carefully consider what is being required of employees. It can be especially useful when a task must be completed under different conditions or if it’s never been attempted before. Manageability – How is it done safely? Consequences – Can things go wrong? Urgency – Why it must be done? Feasibility – Can it be done? Advisability – Should it be done? The “Danger Check” is not a JSA or risk assessment nor does it replace either one. It is a tool that a supervisor can use when evaluating a task in advance of the JSA or risk assessment process. It helps identify some of the concerns that the supervisor should anticipate in the workplace. It’s not technical nor complicated. It’s another simple tool intended to help supervisors build and maintain a Safely Working™ Environment. Safe 6: Step Two…… …… …… we’ll get to that later. While we believe what The Safely Working Project is promoting will be useful to all employers and safety professionals, our efforts are directed at those small businesses that can’t afford or don’t have a safety professional to facilitate workplace safety. 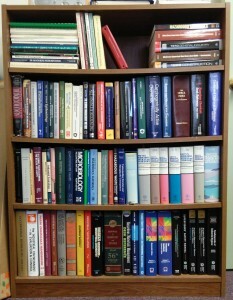 Recently, I organized my “safety” bookshelf after gathering several stacks of books scattered around my office. I have accumulated a significant library over the years in support of my training, safety and industrial hygiene activities. Many are recommended references and textbooks for the environmental, health and safety profession. Click on the photo to get a closer look at the titles. 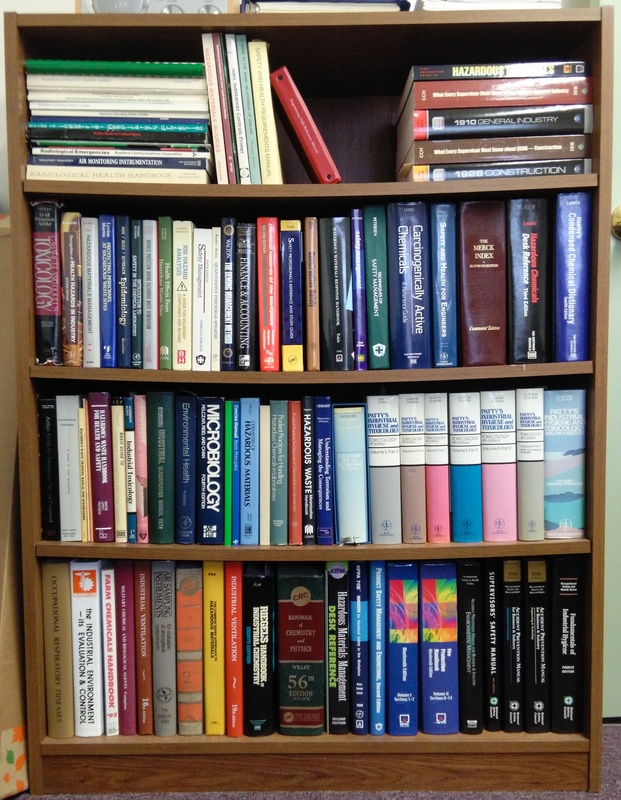 It occurred to me that my bookshelf provides additional evidence of why many managers and company owners see a barrier when it comes to safety. I don’t mean the expense involved in buying the books. I’m referring to the implied expertise required to find, interpret and apply the appropriate information and guidance. It’s not unlike the perception of a “forlorn hope.” This perception suggests that safety is not without great perseverance and incredible expense. Are these books required for establishing and building a Safely Working™ Environment in a workplace? Is safety really a “forlorn hope?” Certainly not. I’m confident many successful safety programs have been established without these books, even before the Internet existed. A Safely Working™ Environment is more than safety, it’s how things get done. It doesn’t take a huge budget to make it happen. That doesn’t mean these books aren’t useful. They’re great when you have a program already. They are very helpful when you know what you need. But, if you aren’t sure what you are looking for, these books can be overwhelming. That’s why The Safely Working Project is focused on assisting employers build a Safely Working™ Environment in their place of work. It doesn’t take books to create a Safely Working™ Environment. It takes supervisors and employees using “Sensible Care.” Safe 6® needs to be the one workplace rule that rules them all! It really works when an employer is committed to Safely Working™ 100% of the Time. It doesn’t take a technical library to do it. At times I feel like a missionary. While my colleagues have important positions in firms and corporations with strong commitments to safety I’m dedicated to promoting Safely Working where safety is not a significant part of the culture. My colleagues are responsible and accountable for building and maintaining leading edge safety programs. Employees enjoy safe working conditions and a culture that helps assure they go home every day able to enjoy their families and lifestyle. I’m don’t envy them. I’m sure they have challenges that I’ve not experienced during my career. The fact is, the majority of my experience has been with employers that don’t have safety programs. In many instances my efforts were accepted grudgingly only to satisfy certain OSHA dictates or customer requirements. In others, one visit or training session was regarded as all that’s needed. The box has been checked. When those employees go home healthy at night it’s a result based more on luck than any coordinated effort. So, is chance a reasonable approach to safety? Why don’t some employers take safety seriously? The reasons are many…. “We aren’t covered by OSHA.”…. “We never have accidents.” …. “Safety is common sense.” …. “We can’t afford safety.” …… “Our business is not dangerous” …… “We aren’t big enough to have a safety program.” …… “Safety isn’t important.” …… “It’s up to employees to be safe.” But the reasons aren’t important. What is important is that chance is not an acceptable approach to safety for any size employer. That experience led to the creation of The Safely Working Project. We are promoting knowledge and tools for employees and supervisors to remove chance from the workplace. With employees and supervisors empowered with safely working knowledge chance of mishaps is reduced. Safely Working becomes the norm. Our objective is to get this information to those employees who need it more than others. Every employee deserves to work in a safe workplace. Every employee needs to know how to be safely working, not how to take a chance!